During the 60s when I was a kid growing up in a middle-class NYC suburb, loving music, including Motown that was maturing right along with me, I learned about racism. As I matured I was glad Americans were addressing our human ignorance that for generation harmed many of our fellow human beings. I was happy to see American society was creating laws to educate and protect all American from human ignorance, actively attempting to end generations of disrespect and pain my dark complected Americans brothers and sisters experienced, including my Motown friends who always made me smile. However, as I evolved as an individual, gathering more life experiences I noticed a new form of disrespect developing and being directed at my Motown friends. This new source of disrespect for my black American neighbors was coming from my Motown friend’s children and grandchildren. During the 60s’-70s mega-talented musicians wrote, composed and produced Motown sounds celebrating life, love, peace and often unity. Today and for the past thirty years many of their children and grandchildren write lyrics for another genre of American ‘music’ that began around the same time society was establishing well-intentioned social programs intended to help heal the pain caused by racism/human-ignorance. This is the period when the new form of disrespect began to brew. Well-intentioned social programs were understandably taken advantage of by some depressed people, mostly single moms, who built large families before acquiring the skills to raise, nurture and independently care for their kids. In the 80s, around the same time a young Shawn ‘Jay Z’ Carter was a midteen harming his peaceful neighbors by developing the drug trade he raps/writes about, I was a Brooklyn cop witnessing the fear, emotional harm and physical damage Shawn Jay Z Carter raps/writes causing to peaceful people living and working in the Marcy Houses, as well as the surrounding neighborhoods. I also witnessed the child abuse, neglect and maltreatment caused to Shawn (and his crew of teens/young men) by the life of struggle and hardship his depressed mom introduced him to in late 1969, during the post-civil rights era when depressed women and teens were irresponsibly building families they introduced into depressed communities. Beginning at paragraph eight, In this October 2012 interview Kendrick reveals who he believes let him down. Seems to me Kendrick identified the source of his depression, the roots of poverty, the child abuse/maltreatment that prevented him, his brothers, sisters, cousins, neighborhood friends and school classmates from enjoying a fairly happy safe childhood. backtolbc, as an adult Kendrick Lamar had the fortitude to let his voice be heard, he’s clearly identified who and what behaviors prevented him, his siblings, neighborhood friends and many of his elementary and JHS classmates from growing up feeling safe, loved and adequately cared for, totally unlike many other American kids his TV told him were enjoying a safe, decent, fun life. In my opinion, Kendrick reveals why many rap hip hop performers write rap performance lyrics characterizing females as “witches and bhores, or inferior beings not worthy of respect. Kendrick indirectly reveals why, for the past three decades my Motown friend’s children and grandchildren been calling females, aka their moms, sisters, grandmas and daughters, nasty foul names? Because they resent their mothers for introducing them to a world filled with pain and struggle. This is the new form of disrespect peaceful people have to contend with. Tupac’s “Dear Mama” and “That’s Just The Way It Is” are two raps in which Tupac revealed who prevented him from experiencing a safe childhood life.. It was his mom, hooked on the poison that Shawn “Jay Z” Carter proudly raps about selling to depressed people like Tupac’s mom. Sadly, an entire $$entertainment industry$$ has been built on the human ignorance of people who are enamored by rap beats, yet do not take a critical look at what inspired the lyrics to many popular or underground rap performances. Because of the big money currently being made by rap producers and performers, I do not anticipate more rappers like Kendrick speaking about the child abuse they were forced to cope with. It is more fun to be making money, relying on human ignorance to keep the cash flowing. Frankly, backtolbc, I am not happy all the good work my Motown friends did to establish before our world that they are peaceful, loving people, has been seriously tainted by moms who abused/neglected their kids, causing their kids to resent them, deflecting and venting their anger and frustrations at mom, by harming their peaceful neighbors. 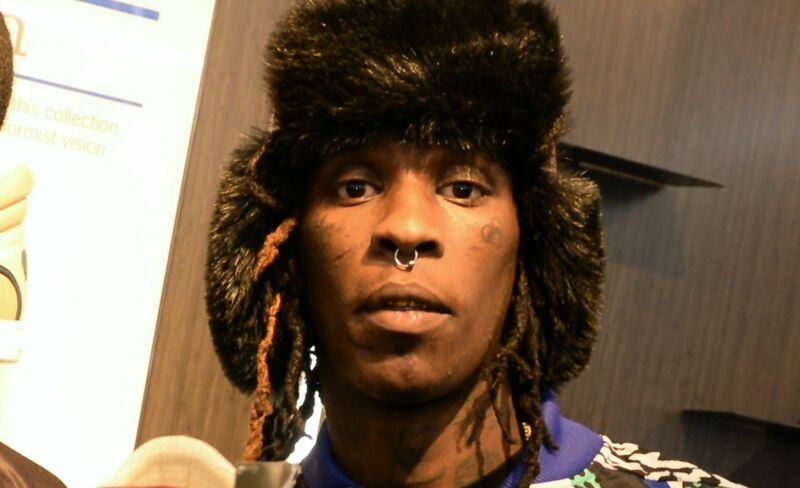 via Young Thug Is Not The Type Of Man He’d Like You To Think He Is. “Young Thug grew up as one of 11 children in the projects of Atlanta. He’s always been a guy who values connections. Young Thug sees those he works with as close as the family he always knew. So for those wondering if there is some sort of romantic intentions behind the way Young Thug behaves regarding his male friends and male recording artists he admires, you’d have to hear Young Thug reflect on his family life and experience growing up. That experience is definitely alluded to within all the vague lyrics and piecemeal phrases and sentences which dot the music here and there on a Young Thug song. Growing up in a big family, not having much, wasn’t easy. Some either fell victim to crime or to a criminal lifestyle, including Thug. But within that struggle, close bonds were formed. And he appreciates family and keeping people close. Despite armed security, Young Thug’s recording sessions are open doors for family and friends. Fader reported on how it looks during one of Young Thug’s recording sessions. Along with his sisters, Young Thug’s recording sessions include friends he grew up with and close associates. If there was any question why he’s known to idolize certain people, it is probably just an extension of idolizing the peers he grew up with, and all the close connections he had. He hasn’t changed that way of looking at things just because he’s had success in the music industry. Ghetto women become moms because of the benefits of being a mom. Take away, or seriously reduce, the welfare payouts, remove the incentives, and the problem will be reduced. One of the current scams is for teen mom to declare she “cannot take care of” her kids, and gives them up to foster care. Grandma volunteers to be foster mom (relatives are given preference). Foster care pays grandma per child, and this is not subject to TANF time limits. In New York, foster care rates include: $746/month for a child over 12 (this goes up to $1,818/mo if the child is deemed “special needs”, which provides an incentive to get the child to qualify as such), plus up to $83/mo for clothing allowances, plus likely eligibility for food stamps, Section 8, etc, etc. Hell, I’m middle class and I don’t spend that much money per child to feed and clothe them.